Company Overview - Hangzhou Rongxin Electronic Equipment Co., Ltd.
13YRSHangzhou Rongxin Electronic Equipment Co., Ltd.
Hangzhou Rongxin Electronic Equipment Co., Ltd. is an enterprise specializing in development, design and manufacture of ozone equipment and mobile antenna. Over more than a decade since the founding, our company has experienced continuous growth with the concerns and cares of insiders and has made large production of "ican" brand ozone generating equipment and various ozone corollary equipment. 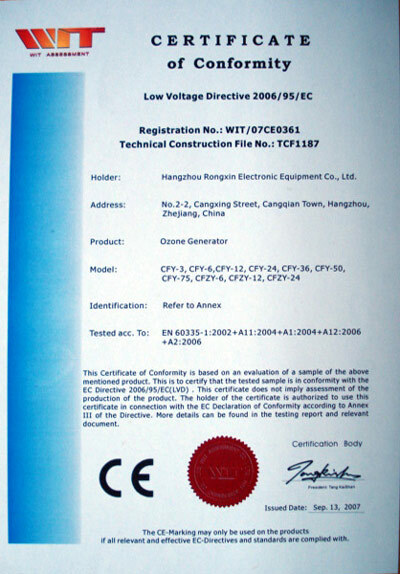 On the original CFY series, "ican" brand ozone generator has been one after another developed into CFZY series of air-typed ozone generators, CFK series of air-typed ozone generators, CFKZ series of air-typed ozone generators, CFK-K series of open-air typed ozone generators and other new products to cater for different sectors and customers.We sincerely hope to cooperate with customers from all over the world. We are sure to provide the qualified products with fast delivery and the best service. Over years, we have accumulated rich experience through the uninterrupted exploration and practice. More than one thousand of well-known enterprises have been our users for long term. We are sincerely gratified to see our customers' continual growth and expansion over the several years. "Specialized Production and Intensified Service" is our unchangeable promise. We are willing to exploit and make vigorous progress hand in hand with friends in all circles for a common development and common creation of nice future.